Product prices and availability are accurate as of 2019-04-14 12:25:36 EDT and are subject to change. Any price and availability information displayed on http://www.amazon.com/ at the time of purchase will apply to the purchase of this product. Get to know 42 composers whose contributions spanned the centuries! 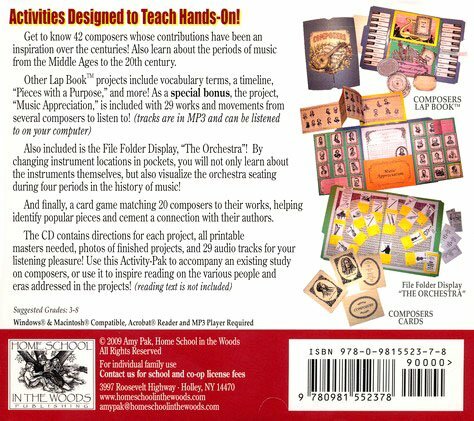 Also learn about various periods of classical music of Western Civilization from the Middle Ages to Modern! Other Lap BookTM projects include vocabulary terms, a timeline, and an understanding of the eras as well as purpose behind the compositions. As an added bonus...Listen to 29 pieces and movements as you record information about each piece and illustrate a picture to go with it! 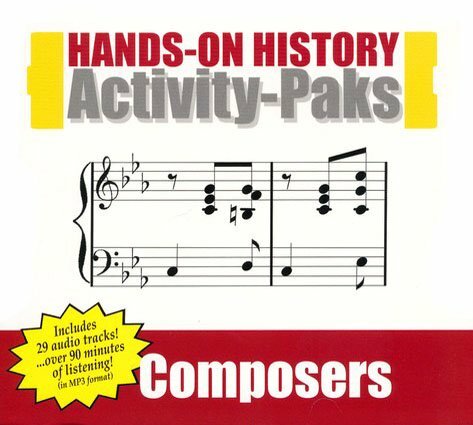 Included in this Activity-Pak are music files for a variety of works, in MP3 format! (Free MP3 players are available on the internet) Also included is the File Folder Display showing Orchestra Seating from four different periods. Watch how the orchestra grew and read about various instruments that were added to it! And finally, a set of cards with 20 composers matching information and their popular works make it a fun way to become familiar with the music and the masters! Use the cards for drill or for playing memory games! Beautifully detailed masters are provided for all printable projects! The "Directions Pages" will provide printing and assembly instructions. Also included are step-by-step illustrated directions for assembling the Lap BookTM. Pages are PDF format, compatable with most PCs & Macs. Adobe Reader® required.